Folonari Bardolino is made from grapes unique to the Veneto region, Bardolino takes its name from a town on the shores of Lake Garda near Verona, Italy where the wine is made. Pale ruby red color. Fresh and fruity bouquet. Taste is light and refreshing, pleasantly fruity.. FFolonari Bardolino Wine can be paired with: red meat, pizza, pasta and antipasto. Folonari Bardolino is made from grapes unique to the Veneto region, Bardolino takes its name from a town on the shores of Lake Garda near Verona, Italy where the wine is made. 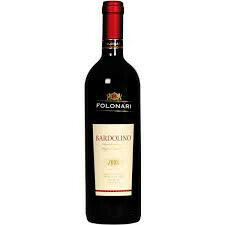 This blend of 55% Corvina, 25% Rondinella, 15% Molinara and 5% Negrara is vinified in stainless steel. An easy-sipping wine; pale ruby red color with a fresh and fruity bouquet with hints of wild cherries and violets. Light and refreshing taste.